Home » Inspiration » And the $100 Winner Is…The Motherhood Costume! And the $100 Winner Is…The Motherhood Costume! Thanks so much to all of you JewishMOMs who sent in submissions for the JewishMOM.com Costume Contest. In the end, the 1st place, $100 winner is Nachlaot’s own Rebbetzin Leah Hartman! 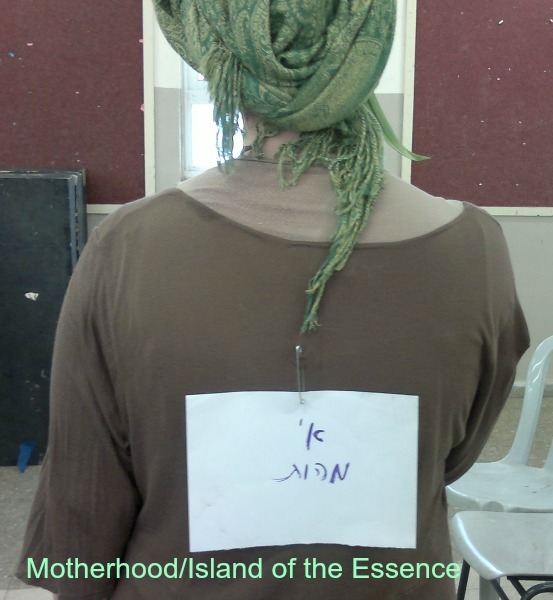 Leah’s wonderfully original costume is a play on the Hebrew word for motherhood: Imahut (אמהות), which also means: an Island of the Essence (אי מהות). 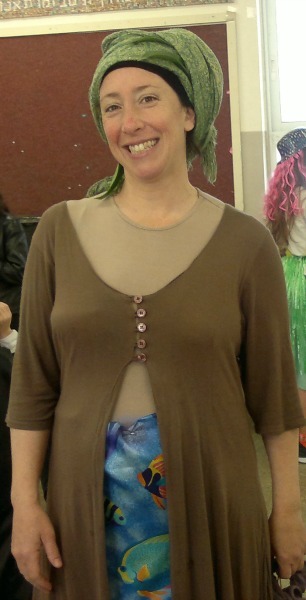 Leah is dressed up as an island with water plants wrapped around her headscarf and a skirt decorated with pictures of fish and the ocean. Way to go, Leah! I’m a mother of 7 beautiful kids ranging from 3 months to 12 years old. I love them and I love being their ima. It’s incredibly intense, and it is as hard as it is wonderful. I am whole about my decision to remain home now, working only very part-time for over 12 years in order to keep each of them home full-time until they are at least 2, and about the sacrifice that demands of all of us. I am told all the time by women friends, “You are so amazing! I don’t know how do it!” They tell me that what I am doing is the most important thing in the world. And deep down I know it. It is why I choose to do it. So why, when that question is asked, or really when I ask it of myself, do I not feel as good about the answer “I’m home full-time with my kids” as I do about the answer “I run a home-based gourmet ice cream company”? Why, when people tell me, referring to my work with my family, “You’re so amazing” do I not take that in as fully as the simple compliment that it is, but have no trouble eating it up (yes, pun intended) when folks tell me, “Wow, your ice cream is so delicious”? Here I am, writing this at 6:25 in the morning. Isn’t that impressive? And why, I am asking myself, is it not impressive that I nursed my baby throughout the night? That as I write these words, I am holding my baby who was crying. Oh right- it is amazing—’cause I’m writing. But what about when I’m just holding my baby? Why is that in and of itself not amazing to me? 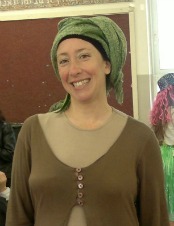 So this Purim I dressed up as an island. I’m not even sure what this means, yet, but I love it. And this Purim, I tried to find out. I prayed to embody my essence, perhaps as if I was on an island, alone, me and G-d ( …and maybe my family could come to)- with no one to mirror myself to. Or to know, to really, really know, that my essence isn’t dependent on anything external, only what is deeply inside of me. loved the costume, and meaning. you should have much nachat always. I am so moved by this. Thank you so much. I feel encouraged to press on. So beautiful! thank you thank you thank you for sharing this with us! so encouraging and supportive. LOVE IT!!!! Thank you for this beautiful and moving jewishmom! I expérience the same doubts as a sahm, every day people ask me when i go back to work since my youngest is allmost two as if they were bothered by my daily home routine… Or they think i am rich enough not to work which is i swear, so untrue!! An eternal question and a beautiful reaction which i will remember as a motto: i mahut!! Wow Leah this was just amazing!!!! Thank u for speaking from your heart to my heart and the heart of so many mothers out there especially mostly full time stay a home moms…..I can’t begin to express how much your words speak to me?!!! So thank u!!! Very inspirational!! I always put myself down and tell people I stay home because I don’t have a degree so it’s not worth it to work. But really I believe in staying at home with my kids. I just always feel judged in. I keep them home usually until first grade. Why is it looked down upon?? May your motherhood bring you the tranquility you deserve! like a south pacific island of endless sunshine, beautiful skies, and rejuvenating oceans… what an inspirational article and costume! I’m glad Leah Hartman won the contest. She’s got clarity and strength, and she deserved to win.